I was asked this question while munching on halloumi salad with veggie fritters at the Scarlet Kitchen last weekend, a pop-up restaurant and cafe part of the E17 art trail. We only went for tea and cakes on our way off foraging. I especially liked their homemade lemonade; fresh, zingy and as cold as winter in Berlin! 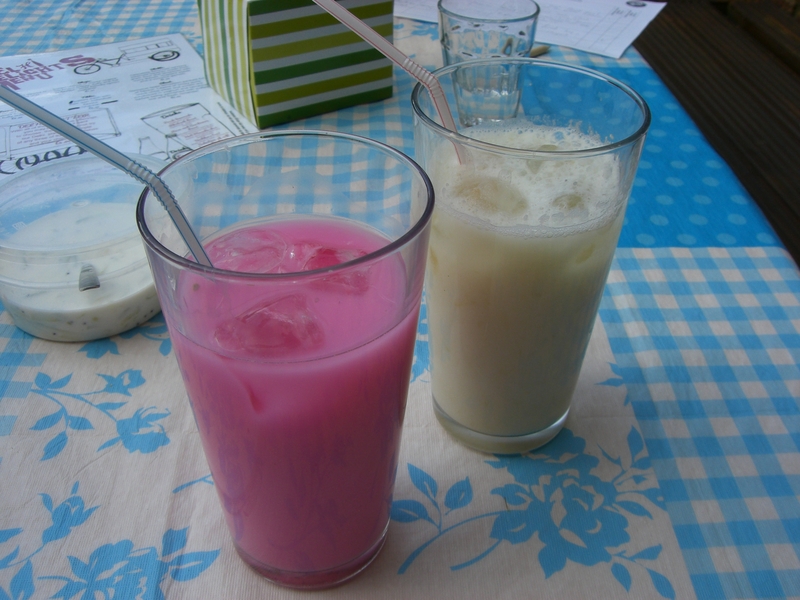 Also on the E17 trail I had the best ever rhubarb lassi at H.A.M. Sandwich+Delhi Delight Pop Up Cafe. The home grown E17 rhubarb made it extra special. My partner in foodie crime had the pinkest drink I have ever seen –rose petal and cardamom lassi. So ‘where do I buy my meat?’ Is this a trick question? Well I try hard not to shop in supermarkets; Walthamstow has the longest street market in Europe so plenty to choose from – no excuse for convenience or lazy shopping. Every year Santa delivers wild game from Yorkshire – two very large freezer bags packed with frozen game, and often a random apple pie and bag of gooseberries. So that sees us usually through the winter, spring and into summer. Ah this explains why the question threw me – what do you mean buy? When I was growing up cash was scarce but bartering was popular. I’d often come home to find a pack of eggs and a brace of feathered pheasants on the doorstep. Much to mum’s annoyance Dad would spend Saturday installing a bathroom suite for ‘someone down the road’ and he’d come home with a crate of Britvic drinks, bag of wild mushrooms, pair of jeans and a fresh trout! Unfortunately this rural way of living doesn’t pay the bills. Can you imagine doing that in London? Although this is making a comeback through time banks, local currencies and skill swap schemes. 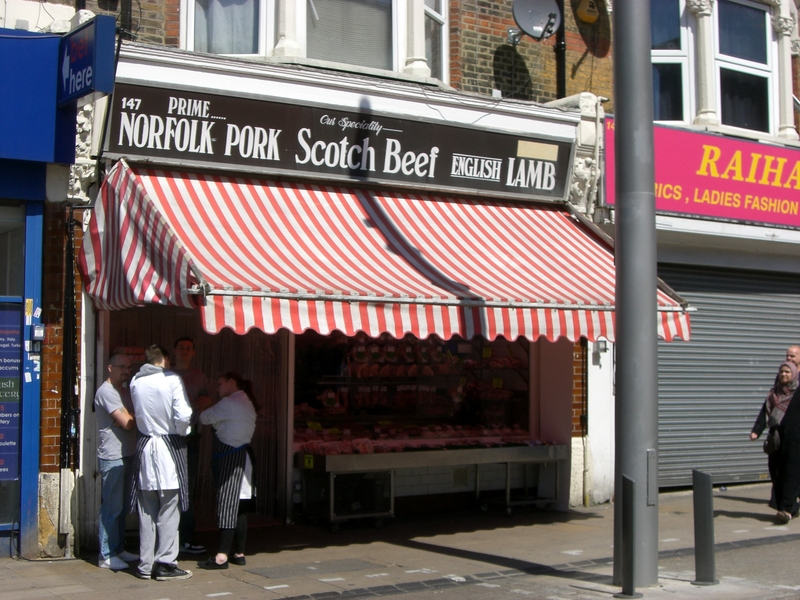 At this time of year I’m usually out of game and so for years I’ve been buying from the busy H R Parsons butchers on 147 High Street, Walthamstow – just up from the now closed Chequers pub. They have a good selection of quality meats, whatever dish you are cooking they are a good bet – all the regular offers plus goat, turkey, rabbit, salt beef, oxtail, home-smoked pork, offal – you name it they have it. They also sell free range eggs and make their own sausages, we go for the chunky beef ones, which as we head into autumn will go down well with mash and loads of mustard. They will prepare your meat whether you want fillet, kebab pieces, skinned, just ask and they always say ‘have a good weekend’ as you leave which makes me smile. They don’t have halal meat but there are lots of other butchers on the market which do. I also sometimes buy organic chickens from the Sunday Walthamstow Farmers Market, which tomorrow will mark its 5th birthday. I know they cost more than a factory-farmed chicken but I can get at least three meals for two from one plus a large pan of fresh stock for a risotto or stew. When I’m feeling like red meat I place an order with Donald Russell – not cheap but have the best in my opinion. Their special meat packs range is often good value, comparable with the high street prices given the quality. Lots of oohing and aarghing when we have their meat for supper – always a good sign! So where do you buy your meat…? Not as simple a question as you may think. This entry was posted in Shopping in E17 and tagged Butchers, Donald Russell, e17 art trail, Game, H R Parsons, H.A.M. Sandwich +Delhi Delight Pop up cafe, London, Meat, organic chicken, pop up restaurant, scarlet kitchen, Walthamstow, Walthamstow Farmers Market, Walthamstow Market. Bookmark the permalink. 1 Response to Where do you buy your meat? We’ve also been shopping from Parson’s for years – they’re great as not only will they prepare your meat if you ask them to, they will always get stuff in on order given a little notice too! I remember getting a fabulous rack of pork last year – and speaking of pork, their pork belly is especially great…a real favourite in our household!